RUSH: You remember yesterday on the big program? Maybe it was two days ago. Yeah. The days are running together. The day of the address to the nation... Well, maybe it was yesterday. One of the last two days. Maggie Haberman of the New York Times is out reporting that the president had a lunch, traditional lunch with anchors the day of his national address. These are all off the record, but some of these Drive-By anchors decided to tell other reporters what happened. Maggie Haberman of the New York Times reported that Trump didn't even want to do this national address, that he didn't even think it was gonna matter, but that his communications staff was telling him he had to do it, and so he was gonna do it but that he didn't think it was gonna matter. Well, CNN is reporting that Trump said not only did he not want to deliver Tuesday night's televised speech, but he doesn't want to go to the border today, either! He didn't want to do either, because he doesn't think it's gonna matter. So what we have here is glaring media malpractice. This leak to the New York Times (if it even was a leak) is a direct violation of a long tradition where the president briefs selected reporters and network anchors before a major address. It's always off the record. But with Trump, all of the norms are gone and all the ethics are gone. If they can embarrass Trump, they'll do it -- and the closer to get to Trump claiming access, then they'll do it even more. So they accept the invitation, they lie to him and his staff saying they'll accept off the record, and then after the lunch they go out and they start telling people what happened in there, probably making this up. So Maggie Haberman reports (impression), "Yeah, Trump didn't even want to do this prime-time address! He's smart enough to know isn't gonna work! Manufactured crisis. Trump knows it isn't gonna work. His staff's making him do it." Now they're reporting that Trump didn't even want to go to the border today, and for the same reason. (summarized) "It isn't gonna matter. Trump thinks it's a waste of time," they're telling us. "It's a waste of energy. It isn't gonna matter a hill of beans and he didn't want to go. But the only reason he's going is because his staff made him go." Something about that doesn't ring true. I mean, he's not married to the staff. So the staff telling him what to do just doesn't fit. If Trump doesn't want to do something, Trump doesn't do it. I think this is more... It's as manufactured as this business that is Chuck Schumer reporting Trump had a temper tantrum and acted like a spoiled child and ran out of the meeting with he and Pelosi today or yesterday. CNN, I'm telling you, they just cannot stop themselves. Trump had this little gaggle today outside the White House. He talked to them for 16 minutes, impromptu, before getting on Marine One to head to the airport to get on the plane to go down to Texas. At this little gaggle, he dubbed the media the opposition party. He accused them of working with Democrats. He called out NBC News as the most dishonest that he's ever seen, and he unloaded on a reporter from ABC News named Jonathan Karl. Trump was discussing the shutdown in the Oval Office after signing an anti-human trafficking bill. Jonathan Karl asked why the president wouldn't sign other bills that would allow certain workers to get paid while a solution to the shutdown's negotiated. Trump said to Jonathan Karl (paraphrased exchange), "You think I should do that? You think I should do that, Jon? I mean, I watch your one-sided reporting. You think I should do that?" Karl tried to say, "Hey, Mr. President, it's not my decision. Not my decision. I'm just asking." But Trump didn't back down. "Hey, Jon? No, seriously, Jon. You think I should just sign it? Just tell me, tell me. You think I just sign?" Karl responded that if he signed, certain workers would get paid. Trump said, "So you would do it? If you were in my position, you would do it?" Jonathan Karl started to explain that he's not in President Trump's position; Trump cut him off again. "I'm asking you, 'Would you do that if you were in my position?' Because if you would do that, you'd never be in this position, 'cause you'd never get anything done. Good-bye, everybody." What Trump was doing... I have been so tempted to do this myself. These clowns, these reporters get in there, and they assume this position of superior judgmentalism, and they go in there with an assumption that anybody would sign this. "Why won't you sign it?" So Trump calls him out. "Oh, you think I should sign it? What would you do, Jon? You've got all the answers? What would you do?" Of course, he doesn't want to answer. Never put themselves on the line. No way. Karl will never say, "Well, I would sign it." That would be crossing a line. He'll never say that, even though he assumes this superiorist position that Trump is an idiot and inhumane for not signing it. So it's purposefully adversarial. It's not productive. It is designed to portray Trump in one way, and Trump is not gonna get the guy to get away it. "What would you do? You think you can do this better than I'm doing it? Come and tell me what you would do." And of course, "Oh, no, Mr. President! I can't. (sputtering) I'm not..."
"Well, then stop the hell acting like you are smarter than everybody else. Stop the hell acting like it is your job. Stop acting the hell like you have all the answers. If you're not even willing to go on record about what you would do, then stop b-i-itching," is what Trump's message was. I'm just telling you, I recognize this air of superiority like they've got all the answers, like they've never done anything wrong. They've never made any mistakes. They have never got a DUI. They have never had an illegal alien cross into their yard to work. They have never gotten anybody pregnant out of wedlock. Never done anything, paragons of virtue! They sit there with this uppity judgmentalism, and everybody acts afraid and defensive around them, and Trump doesn't. Let's go a couple audio sound bites on this. No. 1 and No. 2. This is from this little 15-, 16-minute press gaggle, Trump talking with reporters on his way to the helicopter. THE PRESIDENT: We're negotiating and having tremendous success with China -- and I find China, frankly, in many ways to be far more honorable than Cryin' Chuck and Nancy. I really do. I think that China is actually much easier to deal with than the opposition party. RUSH: Oh! Well, folks, you can imagine how that went over. That went over like a lead balloon. That did not sit well, that the ChiComs are more honorable than Cryin' Chuck and Nancy, that they're much easier to deal with because they're more up front and honest than Chuck and Nancy. It's much more productive dealing with the ChiComs than it is with the Democrats. (chuckles) The media? Oh! They were righteously indignant -- which to me, if they'd have been consistent, they should have taken that as a compliment. The media loves communists, they idolize communists, and for Trump to think that they're tougher than communists? The media ought to be proud of that. But somehow, for some reason they're insulted that a ChiCom leader is considered to be more upstanding and decent and honorable than lying Chuck and Nancy. So the media was just lobbing questions. It was not a formal press conference. One of the reporters said, "Mr. President! Mr. President! 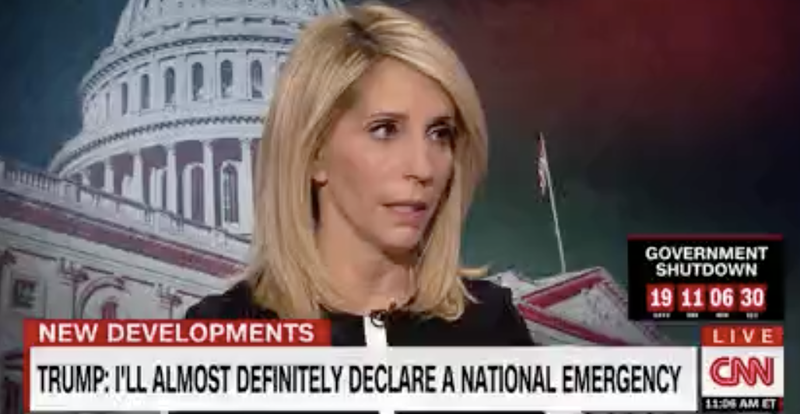 Given how the meeting went yesterday, are you now gonna decide to declare a national emergency? Is that the only option left?" 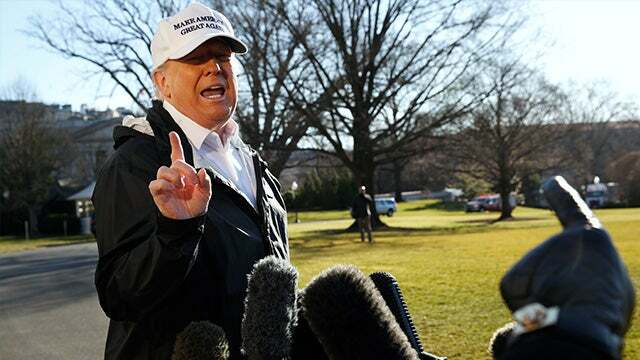 THE PRESIDENT: I have the absolute right to declare a national emergency. The lawyers have so advised me. I'm not prepared to do that yet. But if I have to, I will. I would like to do the deal through Congress. And because it makes sense to do it through Congress. 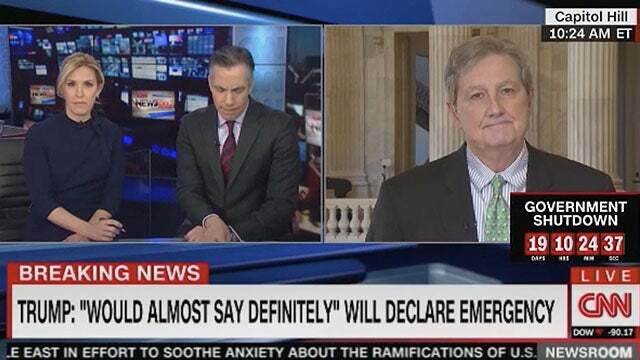 The easy route for me would have been to call a national emergency and do it. And I will tell you, this is a tremendous crisis at the border. Look at President Obama's statements from the past, numerous statements where he calls it a crisis. This is a crisis. RUSH: Let's, in fact, replay that statement from Obama. Grab sound bite number seven. This is what the president was referring to when he talks about Obama acknowledging that the border is a crisis. OBAMA: We now have an actual humanitarian crisis on the border that only underscores the need to drop the politics and fix our immigration system once and for all. In recent weeks we've seen a surge of unaccompanied children arrive at the border, brought here and to other countries by smugglers and traffickers. The journey is unbelievably dangerous for these kids. RUSH: So Trump is now tweeting his thanks to President Obama for supporting him in this, that he appreciates Obama's support. The media is just beside itself with rage and anger that The One is being incorporated by Trump to advocate for his side of the issue. But it's undeniable. You heard Trump say it. Now, later in the morning on CNN, Poppy Harlow could barely contain her rage at Trump during an interview with Senator John Kennedy from Louisiana. RUSH: CNN Newsroom this morning. Poppy Harlow had as her guest Senator John Kennedy. Here we go. Let's just roll the bite. HARLOW: You heard the president many times during campaign say that Mexico would pay for the wall, right? HARLOW: Okay. So he just said this morning, quote, "I never said this." That's not true, he did. Do you think, senator, that the president has misled the American people on who will actually pay for this? KENNEDY: No, and I don't think that's relevant to the discussion. HARLOW: Of course it's relevant. Respectfully, Senator, of course it's relevant to the discussion. Either you tell the American people the truth about more than $5 billion or you don't. Has he misled the American people or has he been honest with them? KENNEDY: Poppy, I understand your point. I just don't agree with it. I just don't think it's relevant to this discussion. The only real relevant issue to this, if you strip away the politics and the personalities and the dislike for each other, is can you seal a 1900-mile border without using, in part, a wall or a physical barrier? “Senator, I beg to disagree with you. Either you tell the American people the truth about more than five billion or you don't. 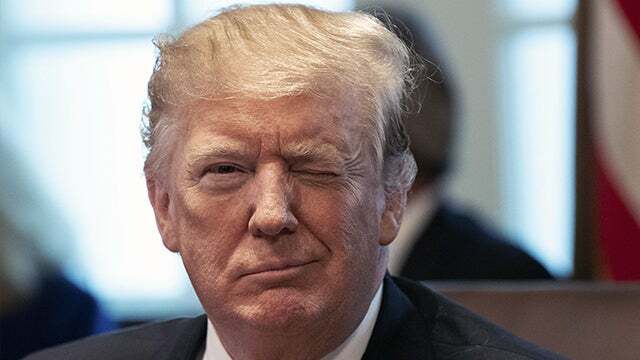 Has he misled the American people or has he been honest?” You want to talk about misleading the American people, grab audio sound bite number 5. Barack Hussein Obama. OBAMA: If you have your plan and you like it and you like your doctor, then you don't have to change plans. The government is not going to make you change plans. You're going to have a plan that lowers premiums by $2,500. If you like your insurance plan, you will keep it. No one will be able to take that away from you. We will start by reducing premiums by as much as $2,500 per family. You can keep your choice of doctor, keep your plan. The only thing we're gonna do is lower costs, cut the average family's premium by about $2,500 per year. RUSH: You want to talk about lying to the American people, Poppy Harlow? I mean, Trump can't even hold a candle to this guy and his whoppers and Bill Clinton before him. But I don't remember CNN being the slightest bit upset over Barack Obama just blatantly lying to people about their health care, that if they like it they can keep it. If they like their doctor, they can keep the doctor, that their premiums are coming down $2,500. But here she is so exercised that the president said he never said Mexico would pay for the wall directly. He lied to the American people. He lied. Senator, how can you say it's not relevant? Because it isn't relevant who pays for the wall. And the evidence of this, you think Trump supporters care? You think they're gonna oppose the wall if Mexico doesn't pay for it? Hell, no! Everybody in Trump land knows that that was Trump goosing everybody. "And Mexico's gonna pay for the wall." Goosing the media, goosing Mexico, goosing Democrats. It doesn't matter to people that support Trump. The wall itself and stopping this insanity, this invasion is what matters. I gotta take a break. We'll be back with much more right after this, folks. 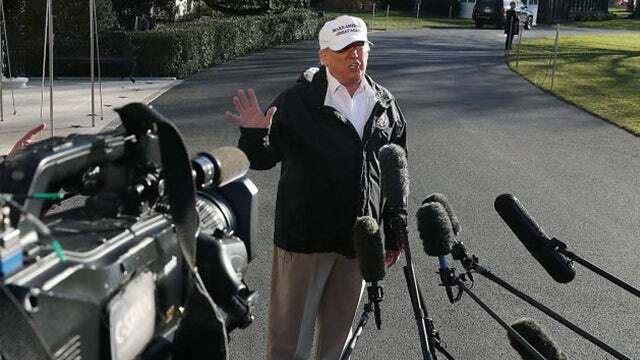 RUSH: Of the many things today that just sent the media into orbit, including the now infamous Poppy Harlow at CNN, this was Trump again in the press gaggle outside the White House. It’s a15-minute little gathering and he's on his way to the helicopter to go out to Air Force One to take the trip to the wall, the border in Texas. And he said this. THE PRESIDENT: During the campaign I would say Mexico's going to pay for it. Obviously I never said this, and I never meant, they're gonna write out a check. I said they're gonna pay for it. They are. They are paying for it with the incredible deal we made called the United States Mexico and Canada, USMCA deal. It's a trade deal. They are paying for the wall indirectly many, many times over by the really great trade deal we just made. Congress has to approve the deal. RUSH: “Obviously I never said this,” has sent them into orbit. “Obviously I never said this. I never said they were gonna write a check.” Now, here's the thing. And I mentioned this a moment ago. I think this is a classic illustration of just how the people in Washington have no idea about Trump. They clearly have no idea, even after two years now, of why Trump supporters support Trump. When Trump made the statement -- you know, this thing Mexico's gonna pay for it is no different than Trump asking the Russians to find Hillary's emails. Everybody knows that he's just goosing people. You know, he's up there, he's improving, he's not on a teleprompter. He’s a real guy. He's having a rally, and everybody's into it, and everybody's reacting to what he says. He's loving it. They're loving it. He knows he's already goosed 'em by talking about the kind of people crossing the border illegally when he came down the escalator, you know, the rapists, the thugs, the murderers, the purse snatchers and so forth. And this guy, like me, loves provoking these people. I love tweaking the media. I'm having so much fun with this business that they think that I'm running the presidency right now. We got another sound bite of this coming up. It's still not over. They're still talking about this. And Trump just bores in. So he's out there saying we're gonna build the biggest, beautiful wall, and it's gonna be the greatest wall in the history of walls. It's gonna be beautiful, it's gonna be the best designed wall, and Mexico's gonna pay for it. The crowd goes nuts. These people taking him literally like this? When is the last time they ever took a president literally? They had to ignore literal with Barack Obama every waking moment of the day! And they happily did so! They simply -- folks, they fired their best at this guy, and they can't dent the battleship. And they're kind of at their wits' end. You know, they think they're on the way to defeating Trump, they won back the House last November in the elections. But they can't get Trump's approval numbers below 44%! Much less down to the twenties or thirties that they're targeting. And they're beside themselves. And so now they're latching onto every little lie he might have told. You think that they might have figured out by now that the way they are going about trying to drive a wedge between Trump and his voters isn't working? Well, no, I think they're too arrogant. In a way they're kind of like bullies in this regard. You can't teach a bully anything, and you can't really open the mind of an arrogant person. And they don't have the capacity nor the humility to accept the possibility that they might be wrong or misjudging somebody or something. This is kind of comical to watch. Poppy Harlow going nuts. By the way, grab audio sound bite number 6. This is Dana Bash. Now, Dana Bash, you need to know this if you don't. Dana Bash and Pelosi, I think, for all intents and purposes, are from the same womb. I mean, not literally. That's the kind of thing Trump would say to describe how close they are. But she is protective of Pelosi. I'm sure that there is a pipeline. Dana Bash is close to a slew of Democrats on Capitol Hill. And she will defend them like a mother protecting her children. And it's so patently obvious. And so when Trump said today that he finds the ChiComs more honorable to deal with than crying Nancy and Chuck, that he finds Xi Jinping to be a nicer, more decent, honorable guy than Chuck, she just lost it. She was having a tough time dealing with that insult. So she goes on CNN and she's talking to the cohost, Jim Sciutto, and here's what she said. BASH: Just the notion of saying that the elected leaders of Congress are less honorable in terms of negotiating than China, the country that steals our intellectual property, that has people in jail for trying to speak out. I mean, I'm talking to a person who lived there for a long time. You can probably list all of the egregious things that they do more than I. You can make your point and stand on what you think is your political high ground without going there. I mean, that just undermines the arguments that he's making. RUSH: You know, if not Dana Bash, the media has gone out of its way to defend socialists and communists all their lives. Communism kills, it doesn't matter where it is, China, Soviet Union, Nicaragua, Cuba, communism kills. And these people have been defending communists for as long as I've been alive! And they defended Stalin, they defend all of the Soviet leaders, they defended the Soviet client state, Nicaragua. They lionized Fidel Castro. So what is this? Getting on Donald Trump for sidling up to Xi Jinping? These people have done all of this and worse and for far longer! 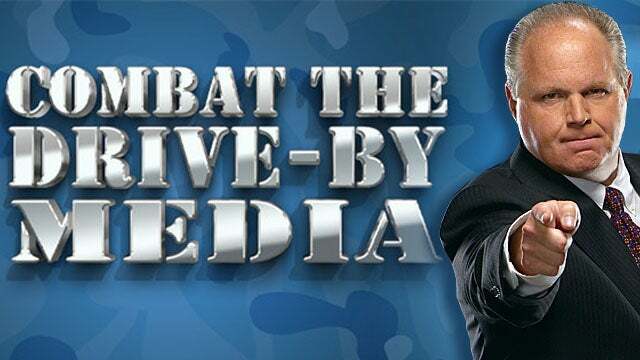 The media in this country is known to have a fetish and almost a groupie association with Fidel Castro and Che Guevara. They were enamored of Mao Tse-tung. Obama's people loved Mao Tse-tung, thought he was a brilliant strategist in the cultural revolution which is basically wiping out an entire society. The idea that Dana Bash is offended because the Trumpster happened to say he has a better time getting along with a ChiCom leader than Chuck and Nancy. Well, I'll guaran-damn-tee, the Drive-By Media would much rather go to dinner with Fidel Castro than they would Newt Gingrich. And one of the reasons they admired Obama and all these other totalitarians is that they are envious of the power these people have. So I'm sorry if I don't take this all that seriously. I think this is a little bit of a straw dog to be so righteously indignant because China kills people and puts people -- everywhere there's communism that happens, and you don't condemn it anywhere, Ms. Bash. Nobody condemns communism in the Drive-By Media. They excuse it! In some cases they lionize it.